Alciato at Glasgow: Emblem: PRINCEPS SUBDITORUM INcolumitatem procurans. Anchora quod nautis, se populo esse suo. 2. 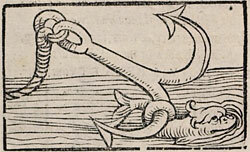 The dolphin was supposed to guide the anchor to a good resting place. It was always friendly to man ([A31a011]). In general, see Erasmus, Adagia 1001, Festina lente.